Lucy is an angel that wants to fly and live in a dragon egg. 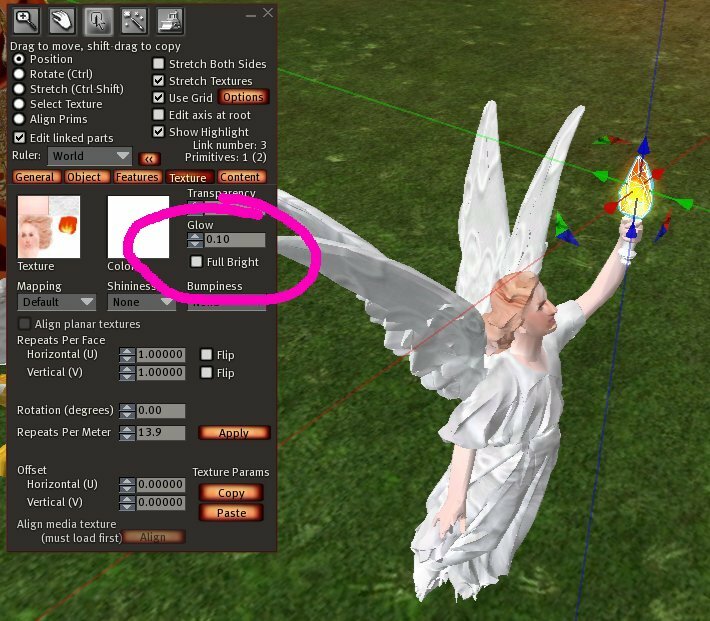 She has been stuck in the Stanford 3D Scanning Repository as very large 116 million triangle angel, but she really wants to be a 2-prim angel and to be able to fly. She wants to live in a 5-prim dragon egg. So she needs your help! 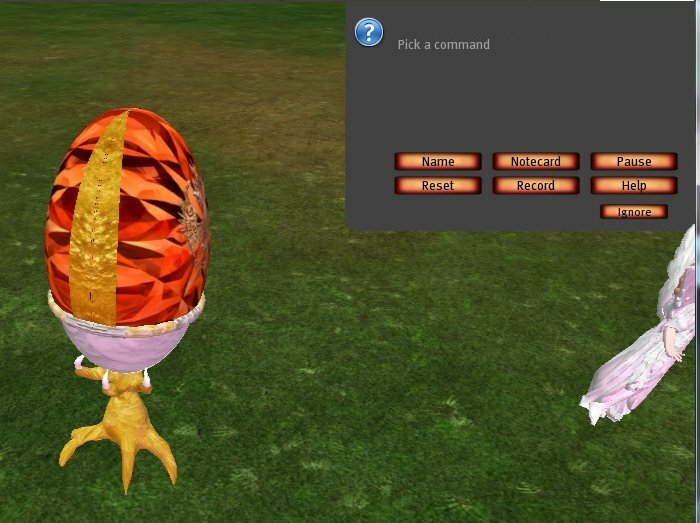 Once you have brought Lucy into your virtual world, just click her dragon egg home. It will open like a flower and let her roam around. Clicking her home again calls her back, and she will wait for you to summon her again. 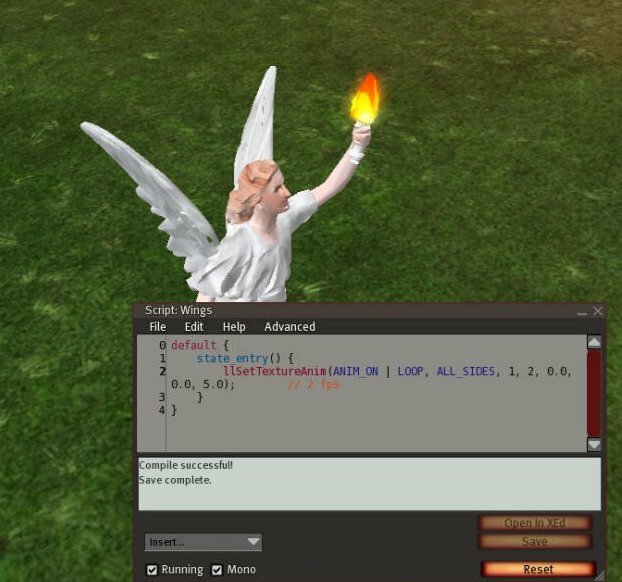 Lucy can fly in Second Life and OpenSim grids, or any other virtual world that supports mesh objects. 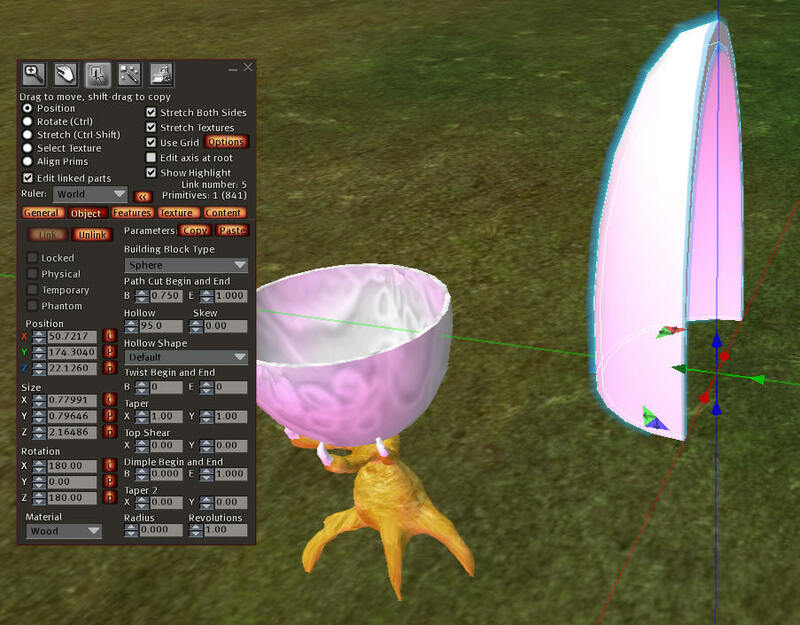 The first step is to upload the mesh pieces. Right click and save this as "egg.dae"
Go to The Uploader menu in your viewer. This picture below is the one in Phoenix. 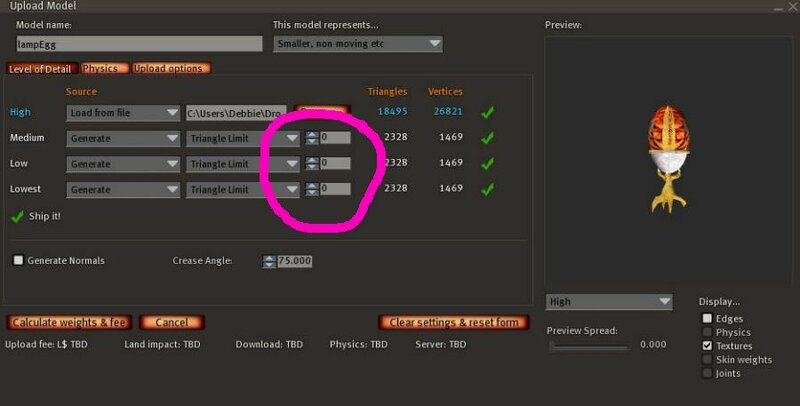 You can use the defaults for the Level of Detail. 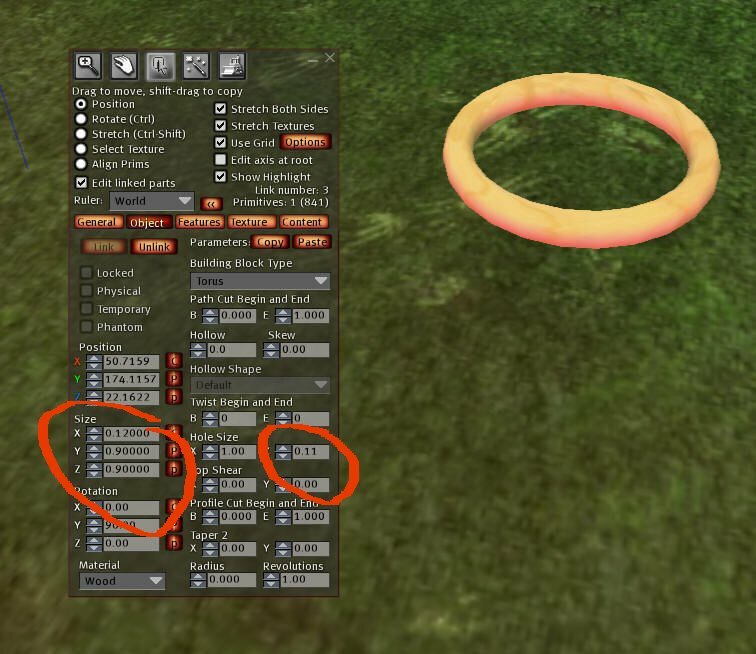 But if you want to keep the number of prims it uses to a minimum, set the numbers next to Medium, Low and Lowest to 0 as shown below. The downside to changing these to 0 is that when you step away from the egg, it will go invisible instead of degrading in quality. 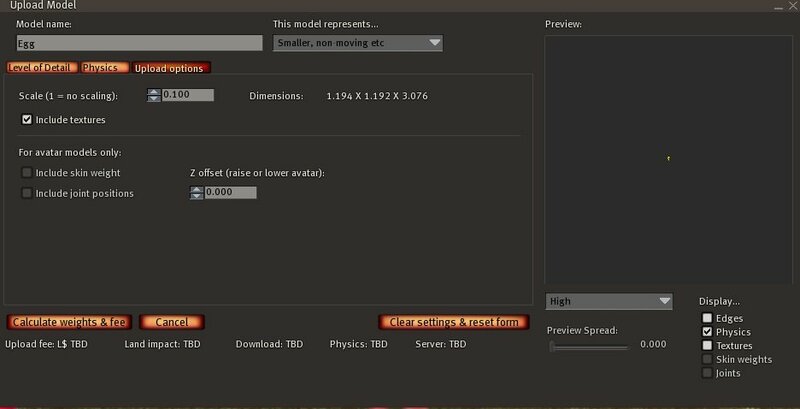 Select the physics tab next. 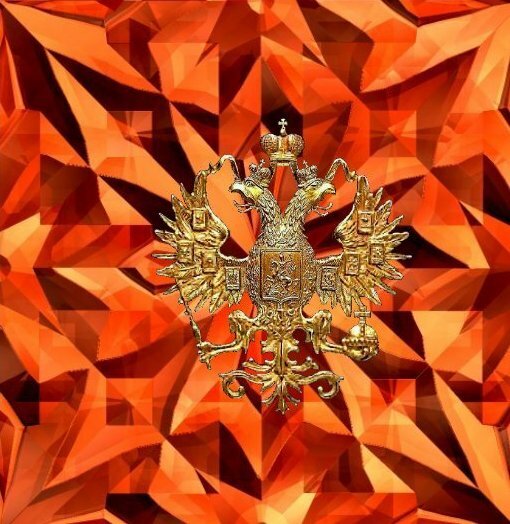 Set the level of detail to Lowest. We are not using physics so this will save prims. 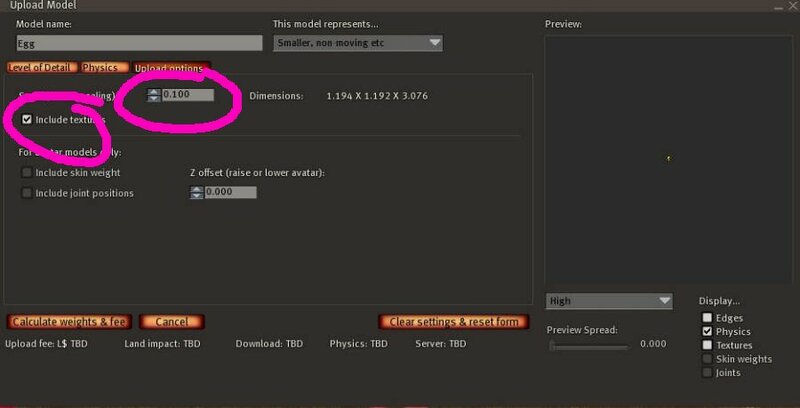 Now select the Upload options tab and select 'Include Textures' and change the scale to "0.100". 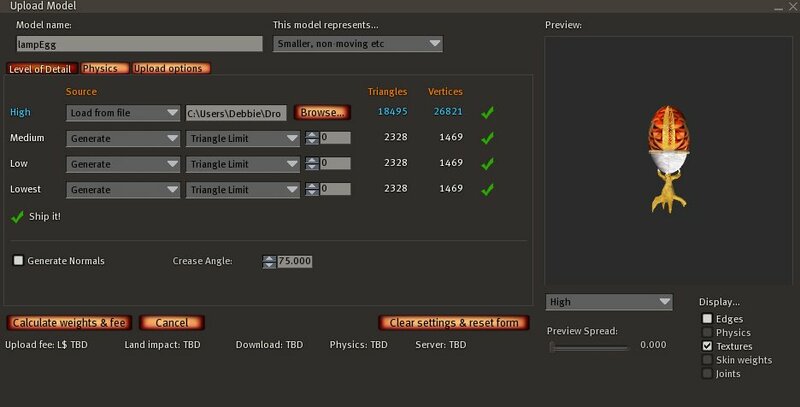 Press Calculate Weights and fees, and then upload the model. 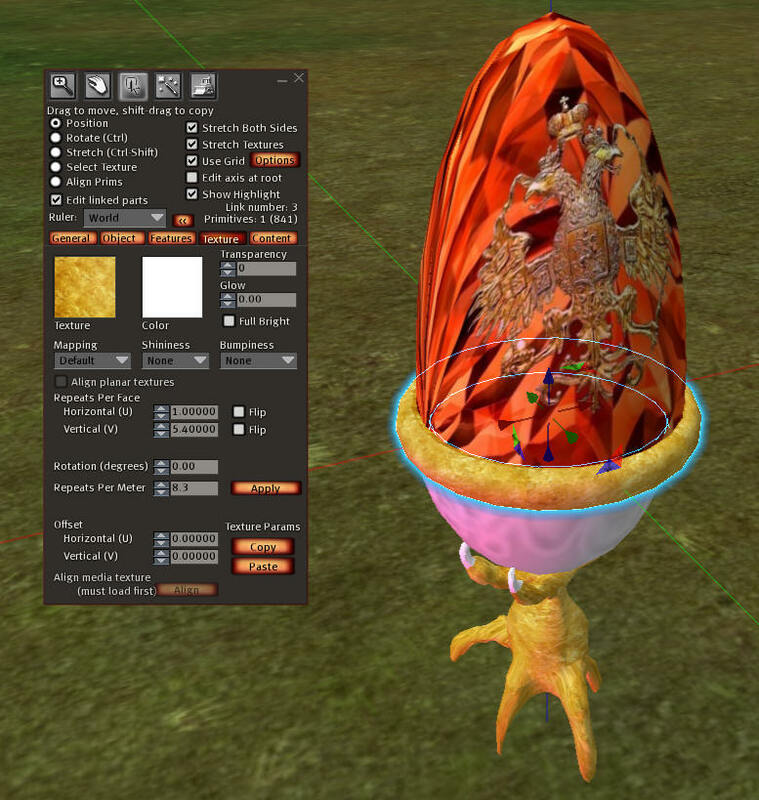 The model will be rather "primmy" due to the eggs being made of mesh. 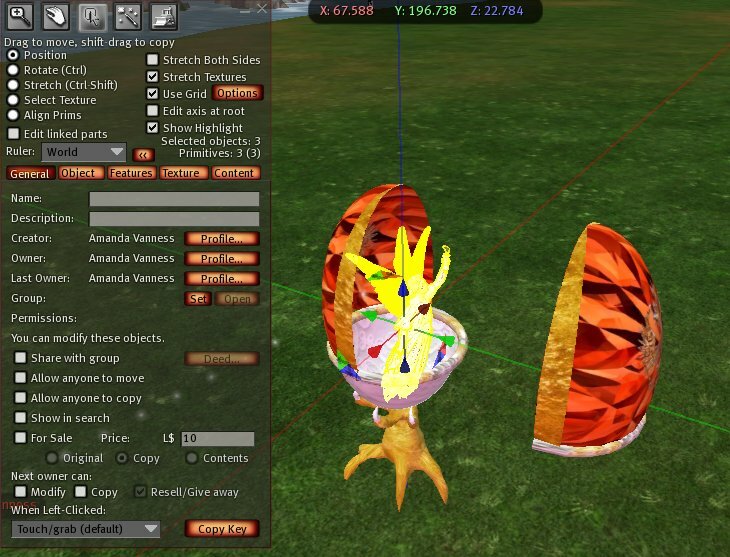 For those of you in Second Life, you can replace them in a later step with prim egg shells. The first step is to extract the angel. Edit the egg and press CTRL-SHIFT-L to unlink it. 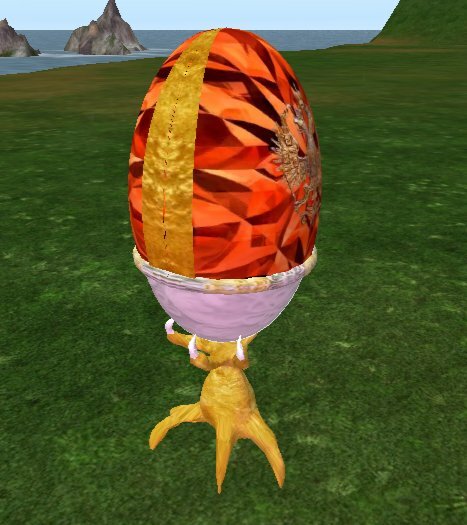 OpenSim users can use the egg as-is as they are not penalized by mesh weights. 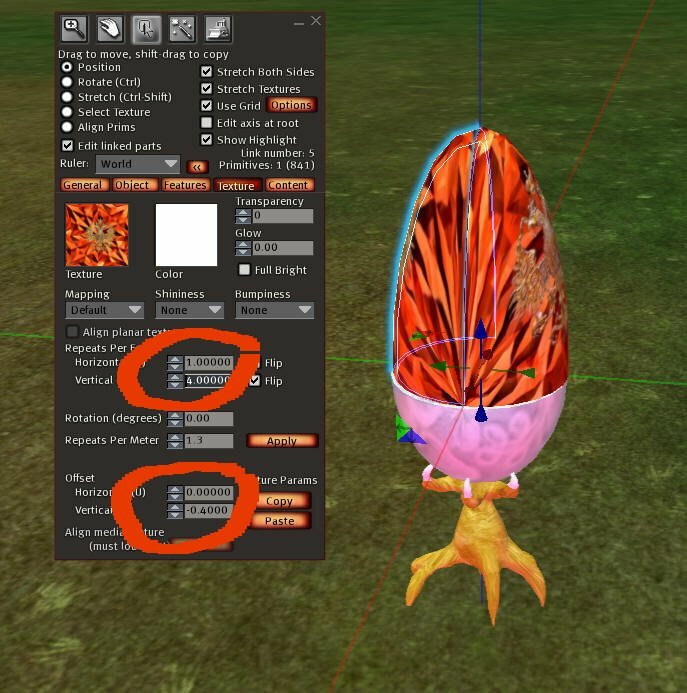 Second Life users will want to change the egg into a prim-based egg to save on prims. 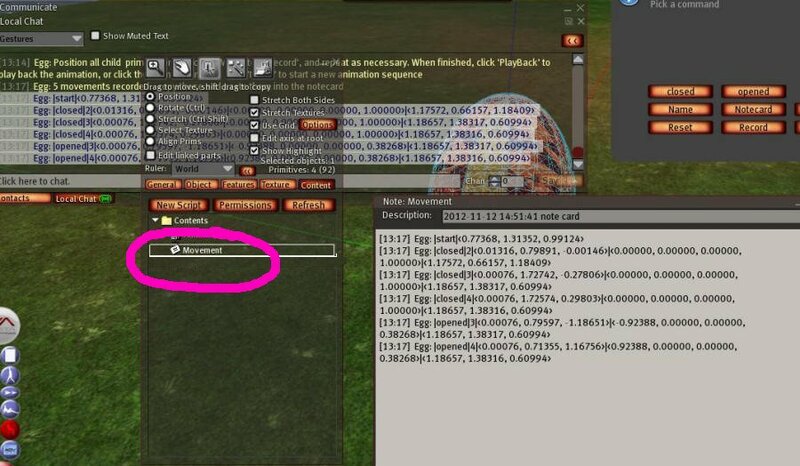 OpenSim users can skip these next steps and go directly to Linking Your Egg. 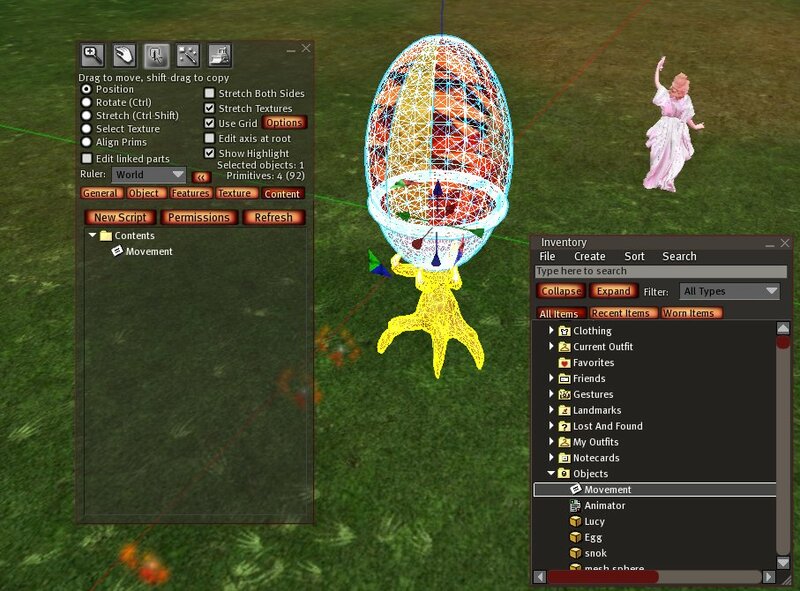 Second Life users will want to replace the egg with prims as shown next. The mesh egg shells are very primmy. 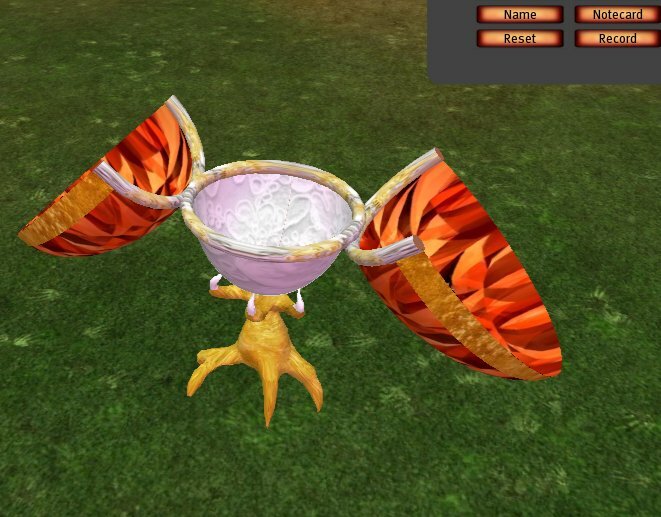 But you can replace them with prim egg shells rather easily. Make a cube and set it to type "sphere". 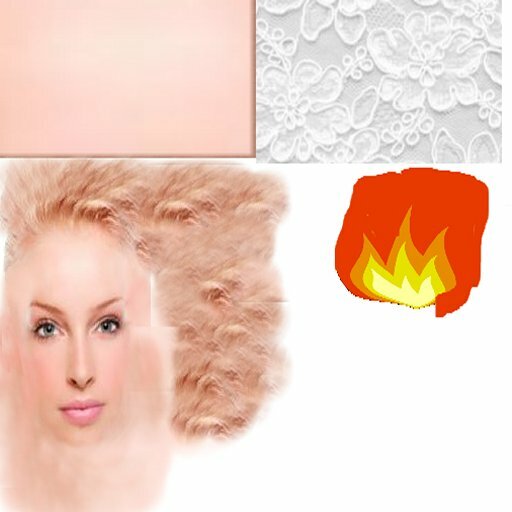 I chose to add this texture, but you can leave yours white, or add a touch of color to it. 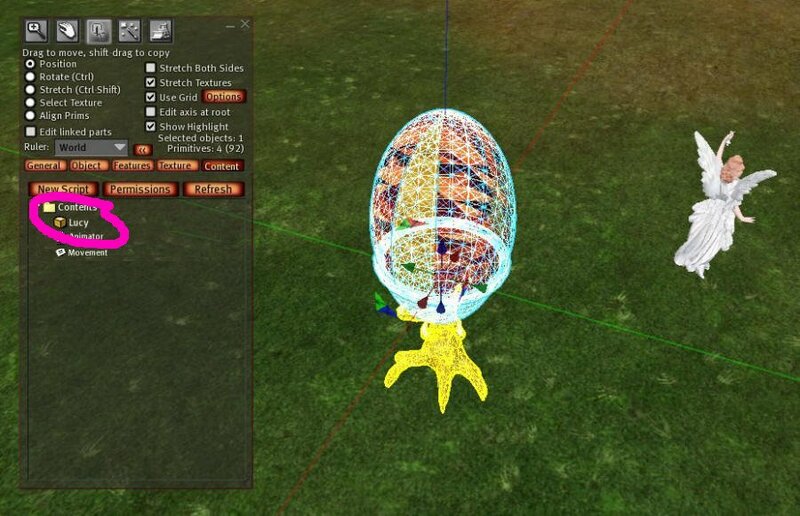 Right click the texture, save it, upload it and apply it to your egg shape. 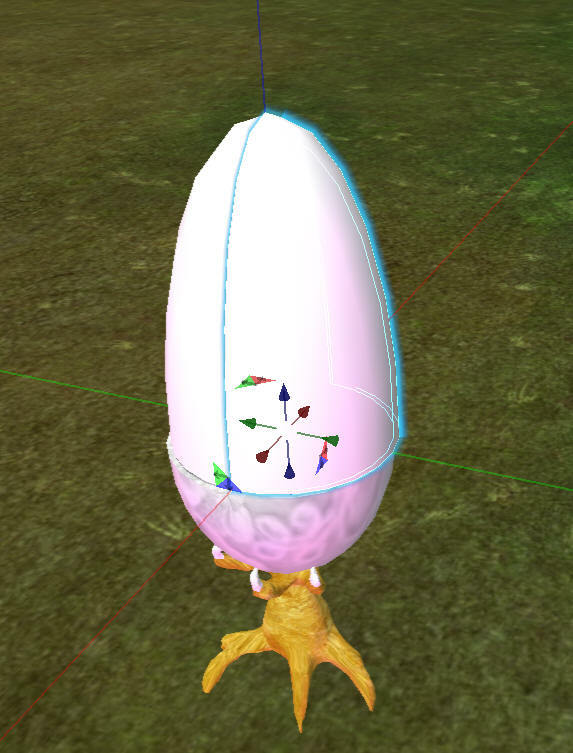 Right click and download the texture, upload it to Second Life, and apply it to the egg halves as shown below. Now we need a replacement ring band around the middle. 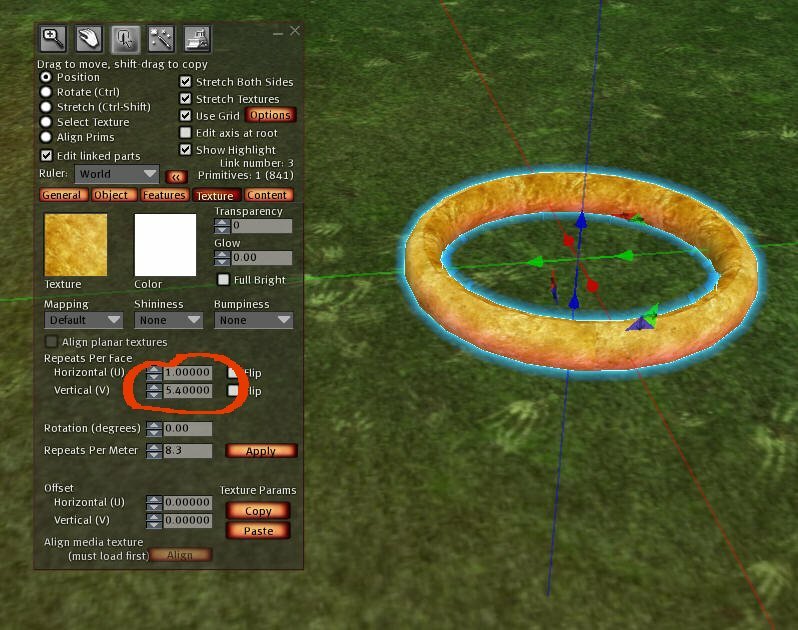 Make another prim, and set it to type "torus". 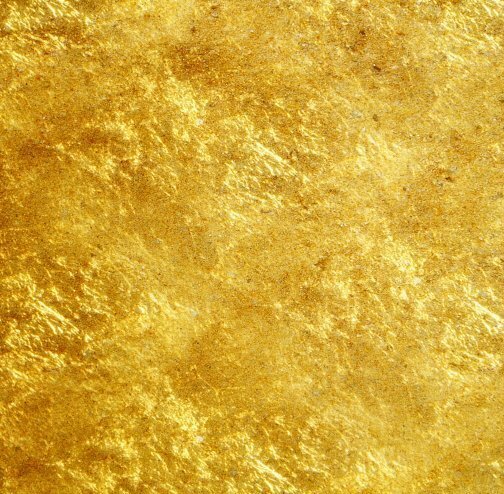 I textured mine with this gold texture, just right click it, save it, and upload and put it on the torus. Now press CTRL-L to link them. The dragon claw base should turn yellow. Okay, lets take a break and get Lucy flying around. We'll finish up the egg after she is free. 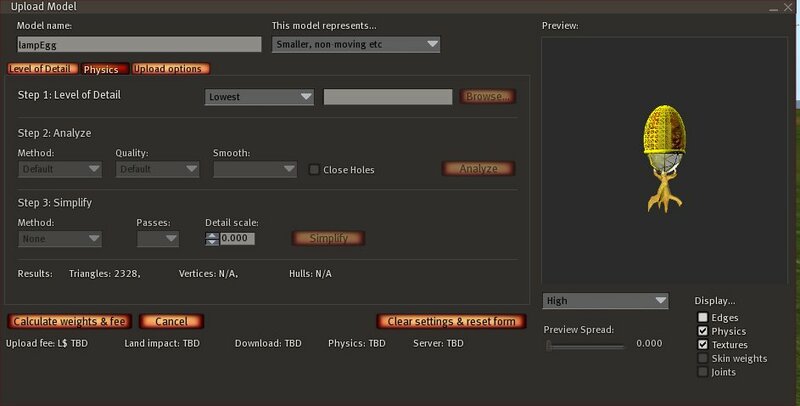 Go into edit mode, select the glowing tip of the flame, and set it to a glow of 0.1 to 0.3 or so. As soon as you do this, the wings should start flapping. Position the wings low on her back and close to her body. 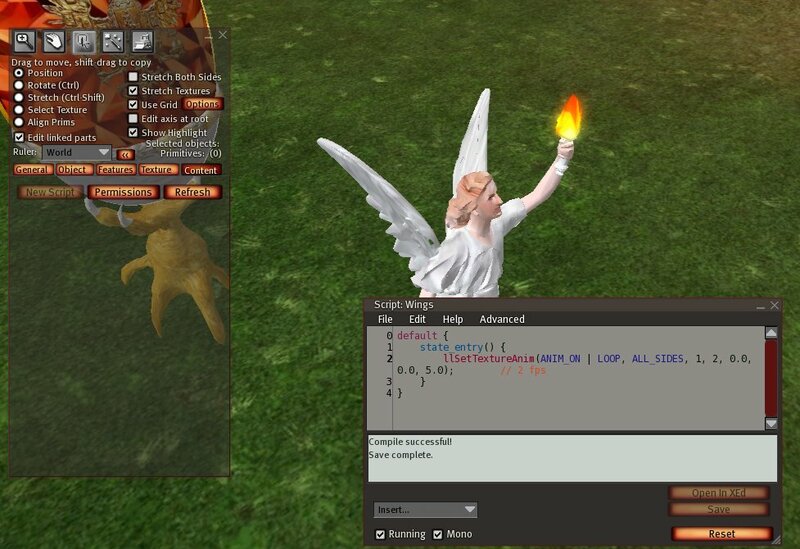 Select the flame, the wings, then lastly, the body, and link them together with CTRL-L. 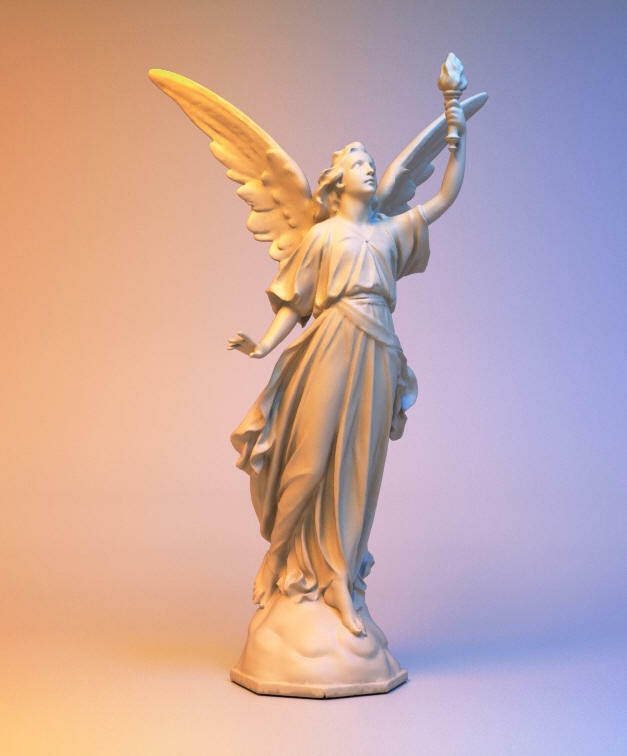 The angel body should turn yellow. Now give her the name "Lucy". This needs to be done just this way or the egg will not work. Now edit the angel and add one more script. 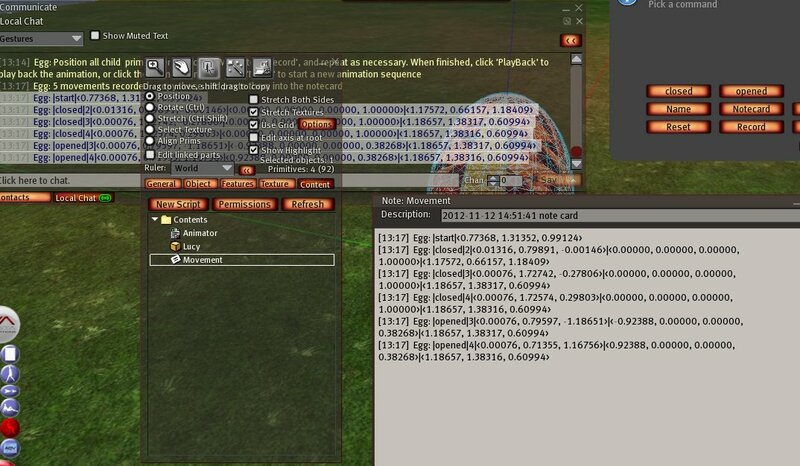 // This is an OpenSim compatible llLookAt()! As soon as you save this script, the angel should flit around and flee like a fly thru the flue. Don't worry, she will only go 4 meters, anywhere from 1/2 to 2 seconds. These times and distances are controlled by the first three lines of code. 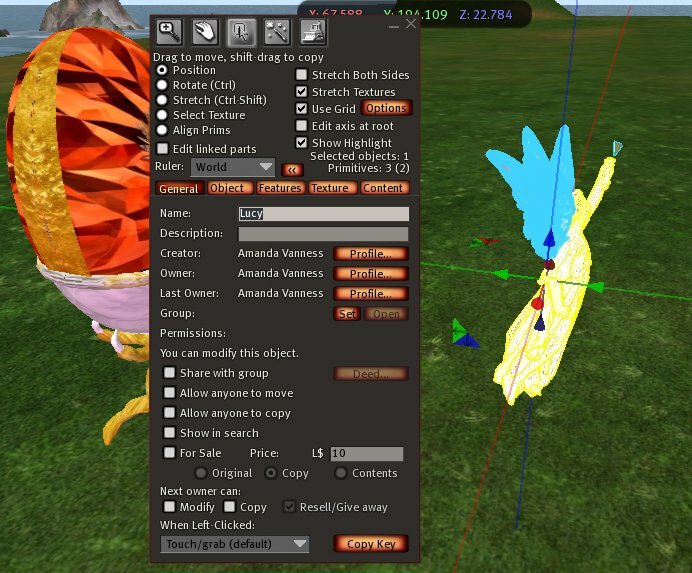 Now take a copy of Lucy for your inventory and let her roam around a bit while we go back the her egg home. Click the Menu item "Name". Instructions will appear in chat. 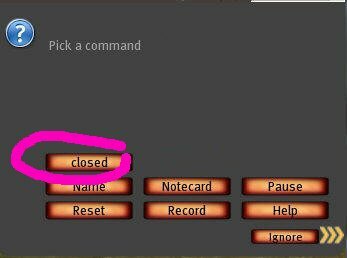 Your next step is to go to the main chat window and type "/600 closed" and press Enter. 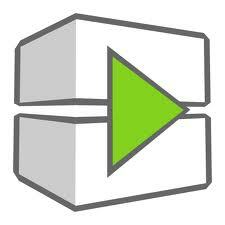 If the channel number it chatted to you is different, use that number. 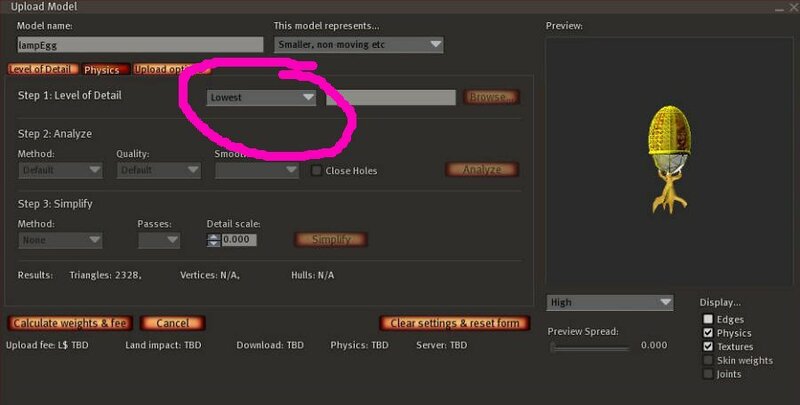 Here is the new button that appears. For now, ignore it. Edi the egg and base and select "Edit Linked Parts". Now press the shift key and unselect the base. Now click the menu Item "NAME"
Go to chat and type in "/600 opened". A new menu item will appear:Again, ignore it. 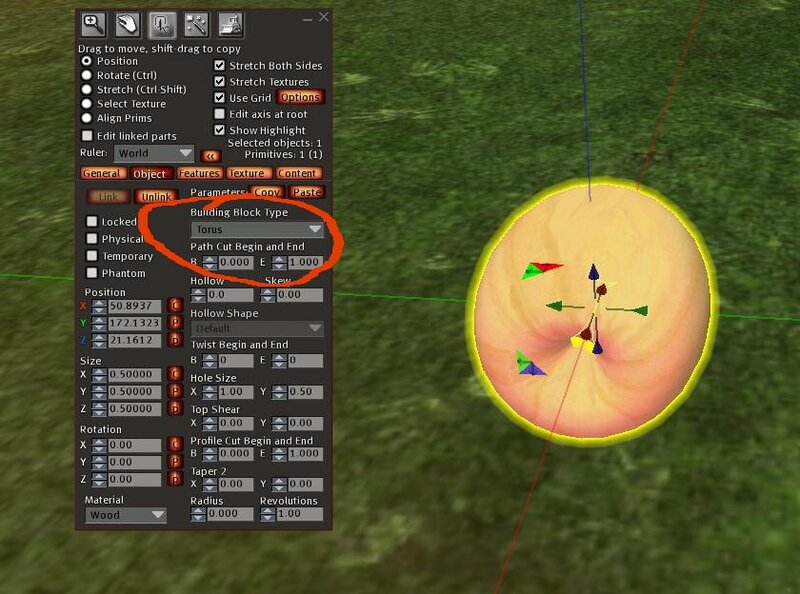 One the prims are positioned, click "Record". 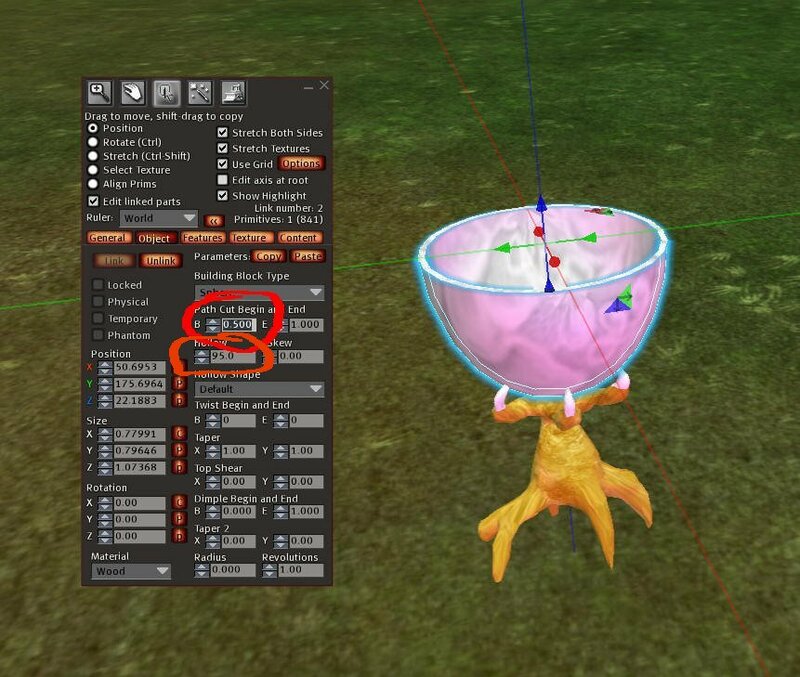 You can now click "opened" and "closed" menu items and the egg should swing open and closed. If you goofed up, just click "reset" and start over. You need to use your mouse and select everything in chat from the line that contains |start| to the end of the chat, and press CTRL-C to get a copy. 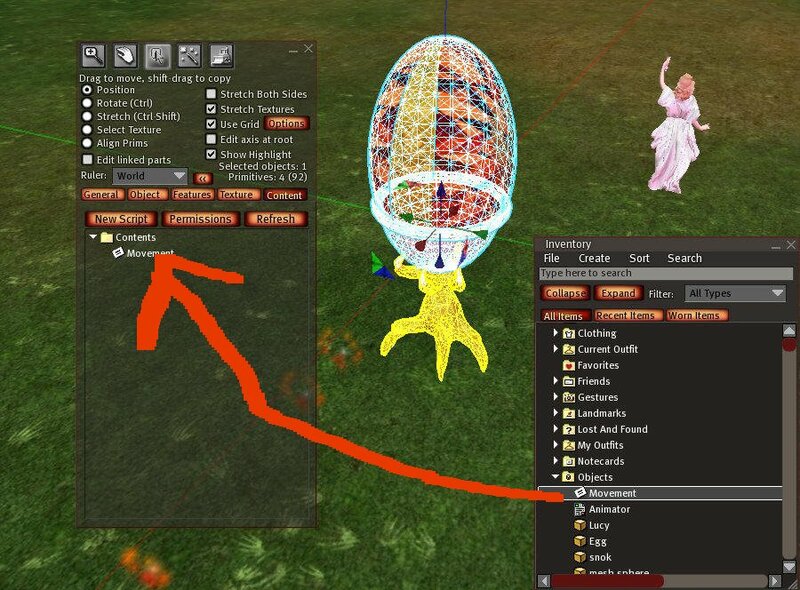 Edit the notecard "Movement" that is inside your Lucy, and paste the text in. Save the noteccard. 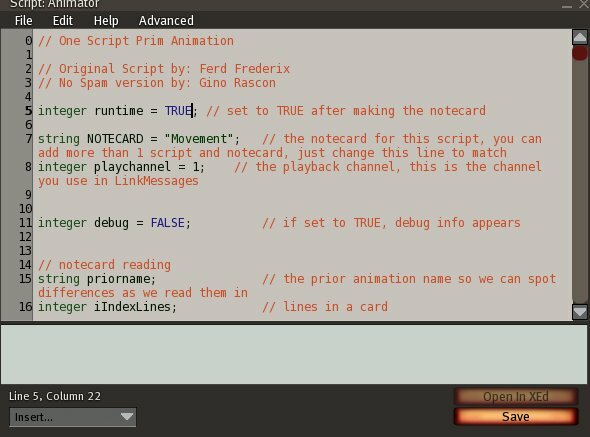 Now edit the Animator script and find the line that says "integer runtime = FALSE;" and change it to TRUE as shown below. 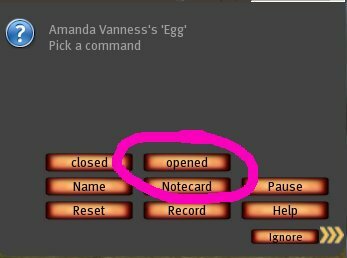 When you save the script, the egg should snap shut and snap open again. 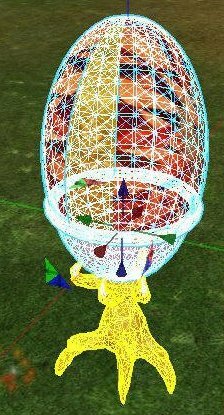 Once you have compiled this script, the egg should snap shut, trapping Lucy inside. Now click the egg and free Lucy. Click it again and she should return. Congratulation! You have freed Lucy and let her fly!